Deemed the "Concierge of Chic," Flowers bridal gowns have always made the bride the focal point of the design. 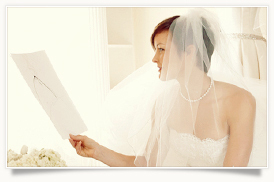 Involved in every detail, from the the initial sketch to the bustling of the bride. The Patti Flowers Design Studio also specializes in heirloom gowns, with the specific knowledge of vintage laces and fabrications to take expert care of these historical family pieces. Patti Flowers has dressed such prestigious women as Former First Lady Laura Bush, Mrs. Emmitt Smith, Willa Ford and other notable women. Flowers' designs are featured in numerous publications including: Women's Wear Daily, People Magazine, D Magazine, and Outdoor Weddings by Mallory Samson. The Studio Collection: classic yet current designs, created for evening, cocktail and daywear. In addition, evening and day wraps compliment, complete and extend your "Studio Collection" look. 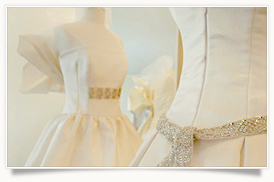 The Parties Dresses are perfect for the bride and her fashionable bridal attendants to transition into future events. Partnering with other artists and designers, Patti Flowers Design Studio will host events to introduce you to many ways you can design and re-design your wardrobe through accessories. 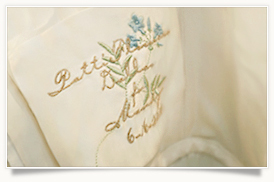 The Collections are available exclusively through the Patti Flowers Design Studio. Please contact our design team for more information.